Up to 35 people die and 100 others are injured after three trains are involved in a collision during morning rush hour in south London. On the morning of 12 December 1988, a crowded passenger train crashed into the rear of another train that had stopped at a signal, just south of Clapham Junction railway station in London, and subsequently sideswiped an empty train travelling in the opposite direction. A total of 35 people were killed in the collision, while 484 were injured. The collision was caused by a signal failure due to a wiring fault. New wiring had been installed, but the old wiring had been left connected at one end, and loose and uninsulated at the other. An independent inquiry, chaired by Anthony Hidden, QC, found that the signalling technician responsible had not been told his working practices were wrong and his work had not been inspected by an independent person. He had also worked a seven-day week for the previous 13 weeks. Critical of the health and safety culture within British Rail at the time, Hidden’s recommendations included ensuring that work was independently inspected and that a senior project manager be made responsible for all aspects of any major, safety-critical project such as re-signalling work. 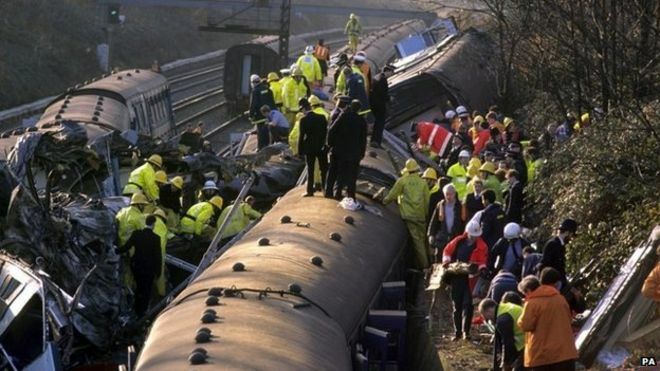 British Rail was fined £250,000 for violations of health and safety law in connection with the accident. On 12 December 1988 the 07:18 from Basingstoke to London Waterloo, a crowded train made up from three four-car 4Vep electric multiple units, was approaching Clapham Junction when the driver saw the signal ahead of him change from green (“proceed”) to red (“danger”). Unable to stop at the signal, he stopped his train at the next signal and then reported to the signal box by telephone. He was told there was nothing wrong with the signal. At this point the following train, the 06:30 from Bournemouth, made up of a 4-REP and two 4TC multiple units, collided with the Basingstoke train. A third train, carrying no passengers and made of two four-car 4Vep units, was passing on the adjacent line in the other direction and was hit by the Bournemouth train immediately after the initial impact. The driver of a fourth train, coasting with no traction current, saw the other trains and managed to come to a stop behind the other two and the signal that should have protected them, which was showing a yellow “caution” aspect instead of a red “danger” aspect. As a result of the collisions, 35 people died, and 69 were seriously injured. Another 415 sustained minor injuries. The driver of the Basingstoke train was standing by the telephone when his train was pushed forward several feet by the collision. He picked up the receiver and spoke to the signalman, informing him of the collision and asking him to call the emergency services. The signalman immediately switched all the signals he could to ‘danger’, and signalled to the adjacent signal boxes he had an obstruction on the line. However he had no control over automatic signals, and was not able to stop the fourth train. He then called the Clapham Junction station manager and asked him to call the emergency services. The accident had tripped the high-voltage feed to the traction current. The operator in the near-by Raynes Park electrical control room suspected there had been a derailment and re-configured the supply so that the nearby Wimbledon line trains could still run. Pupils and teachers from the adjacent Emanuel School were first on the scene of the disaster. They were commended for their service by the then Prime Minister, Margaret Thatcher. As the accident was in central London, the first calls to the police came from members of the public, using public telephones and car phones. The first of the emergency services to arrive was the fire brigade, which was on scene by 08:17. From a bridge over the railway the station officer was able to see the wreckage, and immediately asked for eight fire appliances. At 08:19 and 08:20 he asked for eight ambulances and a surgical team to be sent and at 08:27 declared that it was a major incident. Ambulances arrived at 08:21 and by 08:36, 12 ambulances had been sent. The Metropolitan Police helicopter was used to fly doctors to the site. Rescue was hampered because the railway was in a cutting, with metal fence at the top and a wall at the bottom of a wooded slope, so the local authority cut away the fence, trees and shrubs on the slope into which it cut steps. A mobile canteen was organised by the Salvation Army. The last casualty was taken to hospital at 13:04 and the last body was removed at 15:45. An initial internal investigation showed that a wiring fault meant that the signal would not show a red danger aspect when the track circuit immediately in front of the signal was occupied. Work associated with the Waterloo Area Resignalling Scheme meant new wiring had been installed, but the old wiring had been left connected at one end, and loose and uninsulated at the other. An independent inquiry was chaired by Anthony Hidden, QC for the Department for Transport. A 1978 British Rail Southern Region report had concluded that due to the age of the equipment the re-signalling was needed by 1986, however approval was given in 1984 after a report of three wrong side signal failures. The re-signalling project had been planned assuming more people were available and employees felt that the programme was inflexible and under pressure to get the work done Installation and testing was carried out at weekend during voluntary overtime, the technician having worked a seven-day week for the previous 13 weeks. The re-wiring had been done a few weeks previously, but the fault had only developed the previous day when equipment had been moved and the loose and uninsulated wire had created a false feed to a relay. The signalling technician who had done the work had not cut back, insulated nor tied back the loose wire and his work had not been supervised, nor inspected by an independent person as was required. In particular, a wire count that would have identified that a wire had not been removed was not carried out. There had been inadequate training, assessment, supervision and testing and, with a lack of understanding of the risks of signalling failure, these were not monitored effectively. Critical of the health and safety culture within British Rail at the time, Hidden recommended that unused signal wires needed to be cut back and insulated, and that a testing plan be in place, with the inspection and testing being done by an independent person. Signal technicians needed to attend refresher courses every five years, and testers needed to be trained and certified. Management was to ensure that no one was working high levels of overtime, and a senior project manager made responsible for all aspects of the project. Unprotected wrong side signal failures – where the failure permitted a train to go beyond where it was permitted – had to be reported to the Railway Inspectorate. Cab radios, linking driver and signalman, were recommended and to begin installing public address system on existing trains that were not expected to be withdrawn within five years. Testing was mandated on British Rail signalling work and the hours of work of employees involved in safety critical work was limited. Although British Rail was fined £250,000 for breach of the Health and Safety at Work etc. Act, there was frustration that there was no prosecution for manslaughter. In 1996 the collision was one of the events cited by the Law Commission as reason for new law on manslaughter, resulting in the Corporate Manslaughter and Corporate Homicide Act 2007. A memorial marking the location of the crash site is atop the cutting above the railway on Spencer Park, Battersea.